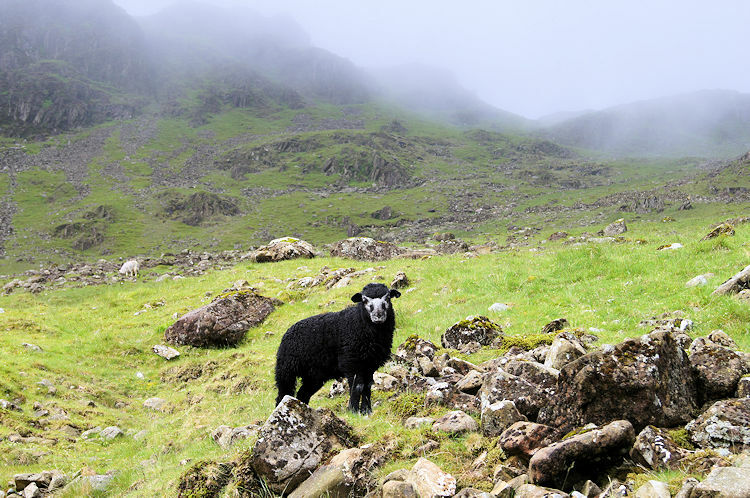 Summary: The ascent to Haystacks was one of Alfred Wainwright's favourites of all his climbs to any of the 214 Lake District Fells featured in his famous Pictorial Guides to the Lake District. 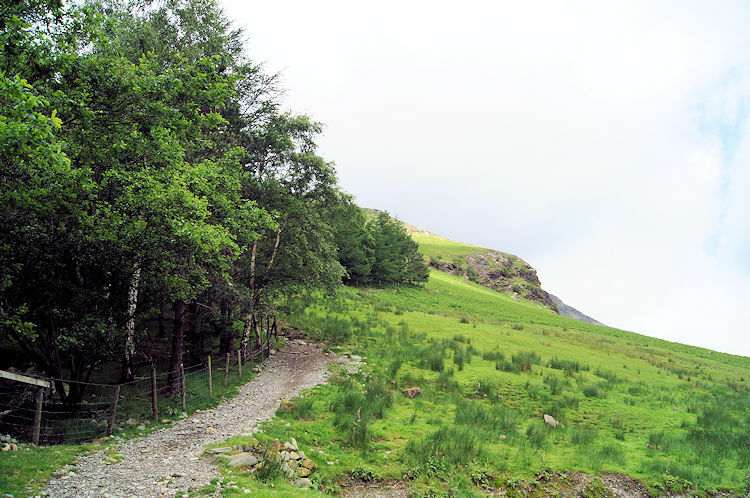 And the ascent was to his favourite mountain of all, the one which is where he chose his ashes to be scattered following a rich life walking the fells of his beloved National Park. After exploring the summit of Haystacks my walk continues via Green Crag and crossing Warnscale Beck to the disused quarries on the slopes of Fleetwith Pike. After passing the site of the old quarries I summit Fleetwith Pike before descending by Fleetwith Edge back to Gatesgarth. 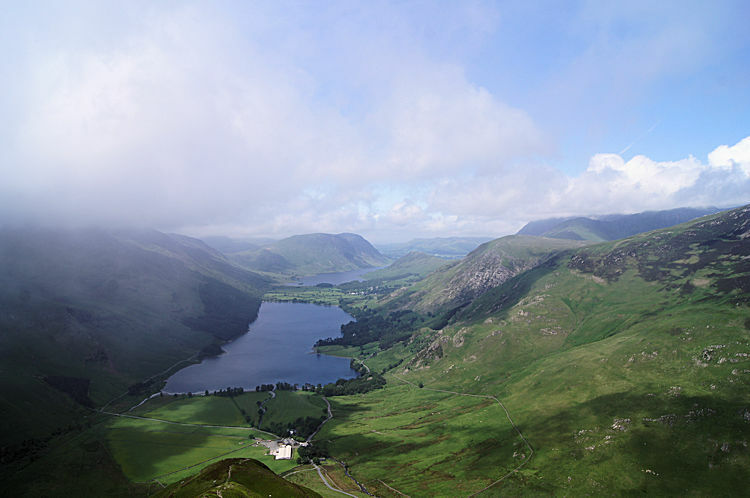 This route was another favourite climb of Wainwright's and while it is a great ascent route I find the descent one of my favourites for the views of Buttermere, Crummock Water are a superb enticement down. The Walk: It was an overcast morning but the pressure was rising. It was the opportunity I was waiting for and despite having not forgotten the deluge which had drenched me on the previous evenings ramble I was going to take the walk I had mapped out a month earlier. A mix of work obligations and bad weather had delayed me until now but there was to be delay no longer. I travelled up the M6 from Manchester to the Lakes, an unusual route for me and while dong so I could see the thick cloud dispersing. The weather continued to improve as I drove the gap on the A591 from Windermere to Keswick and blue sky broke through as I continued through Borrowdale and over Honister Hause to Gatesgarth. I arrived to sunshine. Omens were good. I changed into my walking gear having parked in Gatesgarth Farm Car Park and then set off on my merry way. 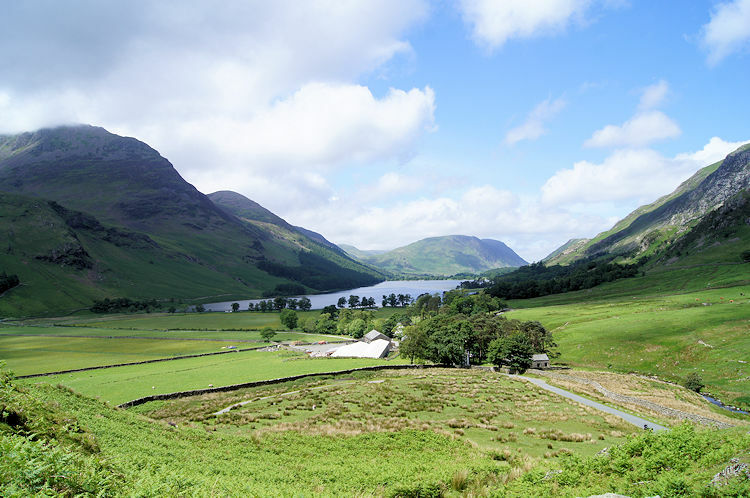 The view ahead spurred me onwards with Warnscale and Buttermere Fell enticingly luring me across the flat stretch of walking from the farm to Peggy's Bridge. I paused for a while before I crossed the footbridge to look at the charming sight to my right with Warnscale Beck flowing into Buttermere. I could not stand too long though as my legs were impatient to get going. I walked onto the fell. After walking up the right hand side of a small wood I turned from a north west course to due south, passing as I did so to look back at e lovely view of Buttermere and it's neighbouring fells including High Snockrigg which was displaying its rugged crags beautifully. After taking in that particular view and banking it I carried on up the path on a course due south towards Scarth Gap. I could see a group of about half a dozen walkers ahead f me and continued towards them, not wanting to close the gap though, I wanted immediate space to myself so I could contemplate for now. 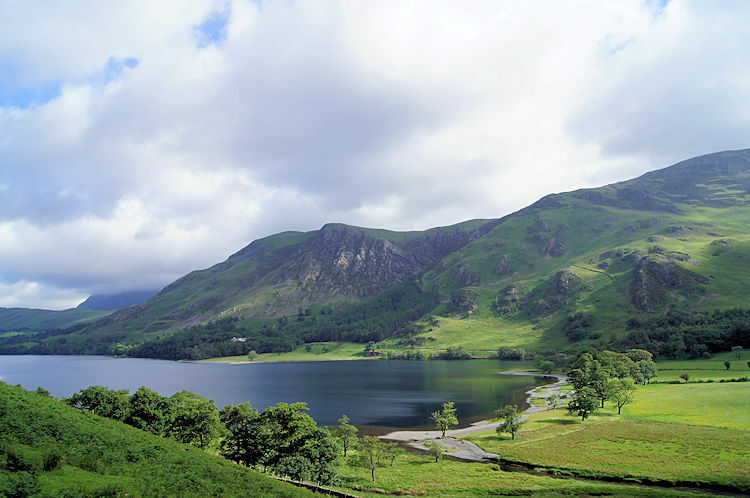 As I continued to climb the north west profile of Fleetwith Pike drew my attention. Clouds were streaming across the mountain from the south east. Sometimes the cloud cleared all but the summit and sometimes banks of cloud caused it to disappear from view completely. The rise of high pressure I had been promised was certainly in action but I guessed it was it going to be quick enough for me today. 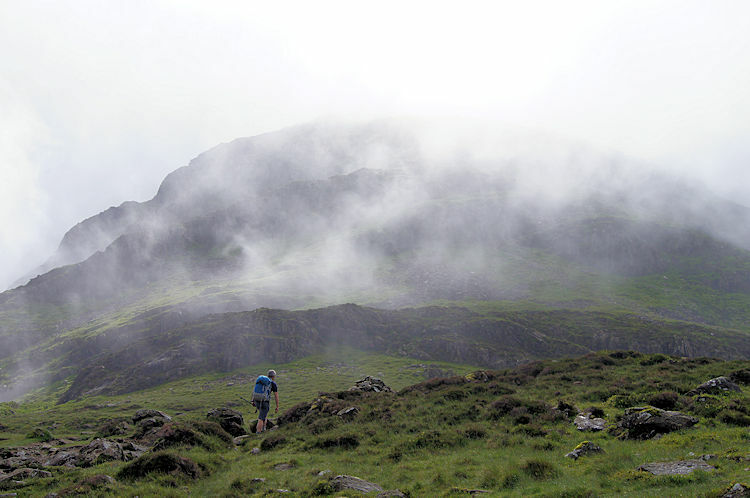 I couldn't see Haystacks yet, the cloud clinging to Wainwright's mountain mischievously. About fifteen minutes after taking the turn above the woodland I reached a series of outcrops about 400 metres beyond a gate. 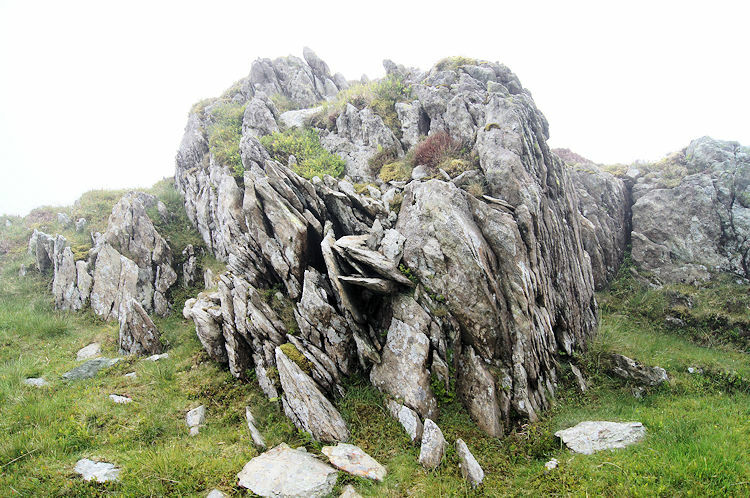 Wainwright had written of them "It is a test of iron discipline to pass without halting several large comfortable boulders athwart the path". Lack of iron will or not I chose to stop near the boulders for a lengthy break in the hope the cloud would lift off Haystacks. I found a spot below the boulders overlooking Warnscale valley and across to Fleetwith Pike. I sat a good twenty minutes watching banks of cloud stream over and sometimes upwards. It did not promise to clear above 500 metres any time soon though so I gave up my vigil and resumed my climb. "Maybe I will be lucky" I mused. Continuing upwards I reached Scarth Gap and rather than follow the path I climbed to my right. Overlooking the path I stood and watched groups of walkers head on through the gap and into cloud, each one of them disappearing ethereally. 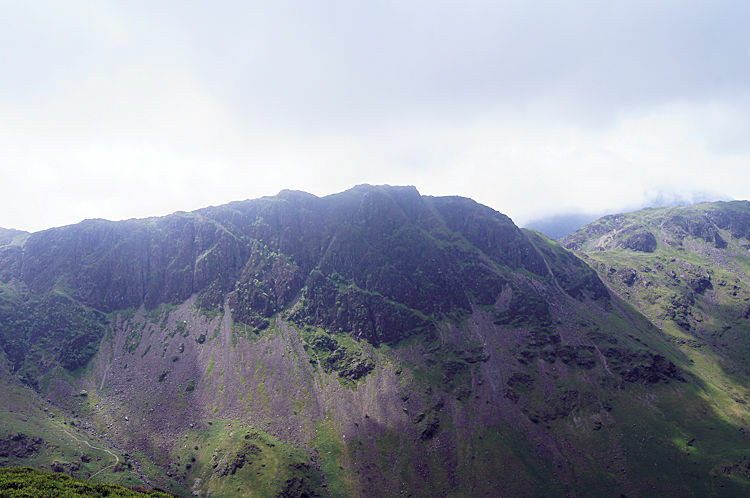 Sometimes they re-emerged and sometimes the heights of rugged Haystacks appeared as well, albeit too briefly though. 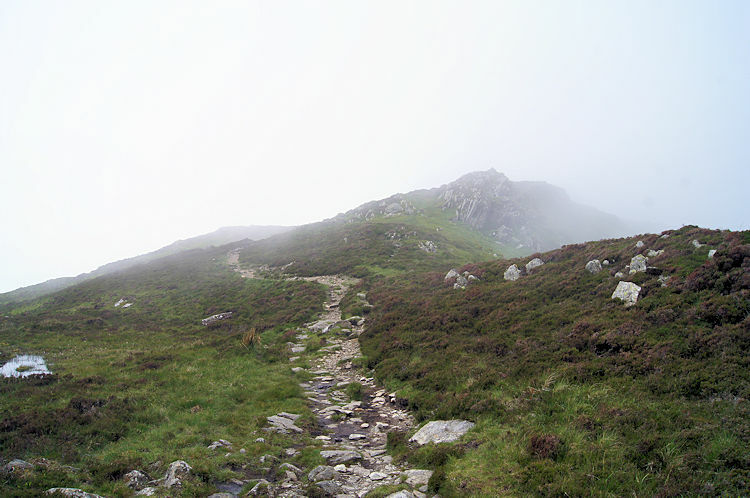 Cloud shrouded her again and as I could not wait any longer I began my climb through the interesting crag paths to the summit. 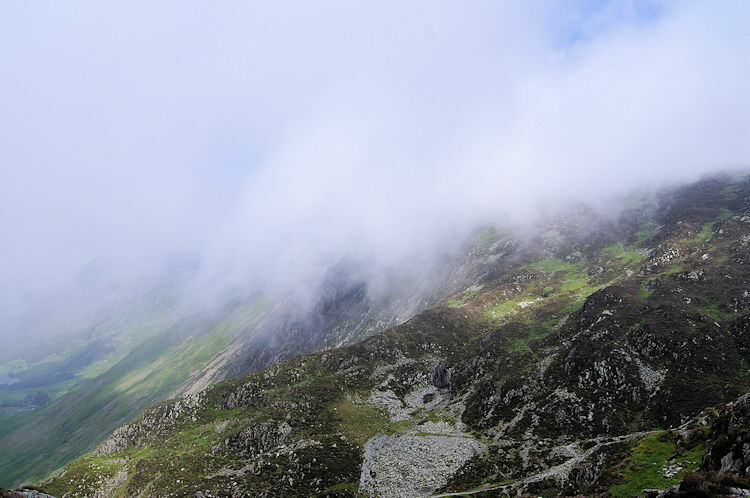 The climb from Scarth Gap to the summit of Haystacks was brilliant. I thoroughly enjoyed the challenge of a series of mini scrambles and the search for the path after each one. 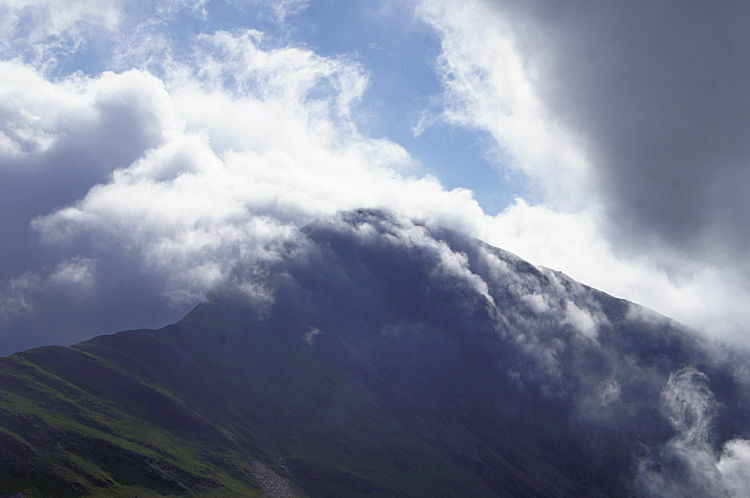 The cloud hanging over the mountain top hindered navigation further and it was not easy to pick out the right route, two or three times I had to slightly backtrack having taken steps to nowhere in particular. Eventually after a series of fun climbs and path renegotiations I reached the top, evidenced by the summit tarn and a very disappointing cairn. The view was not great either, cloud preventing me having one but don't let this put you off. 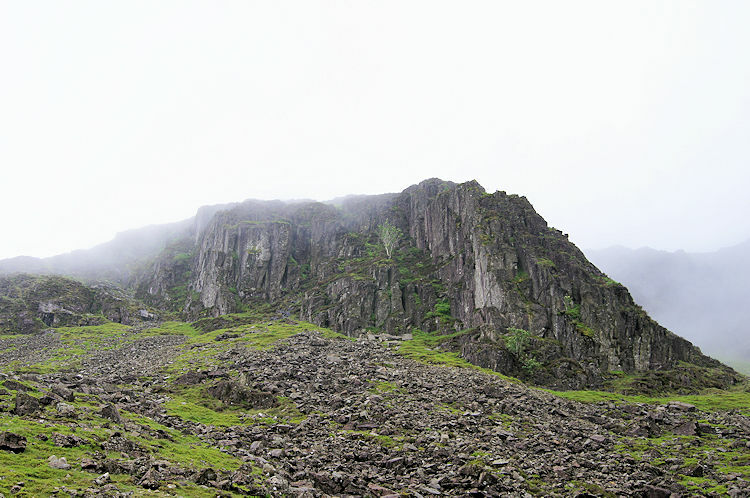 As I could not see for myself I imagined it as Wainwright described "for beauty, variety and interesting detail, for sheer fascination and unique individuality the summit area of Haystacks is supreme. 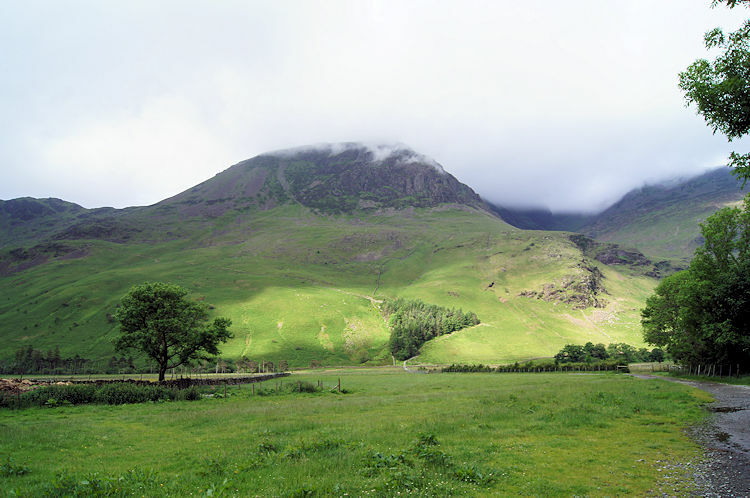 This is in fact the best fell-top of all - a place of great charm and fairyland attractiveness". With that tribute to the summit I must come back one clear day. You must choose a clear day too. 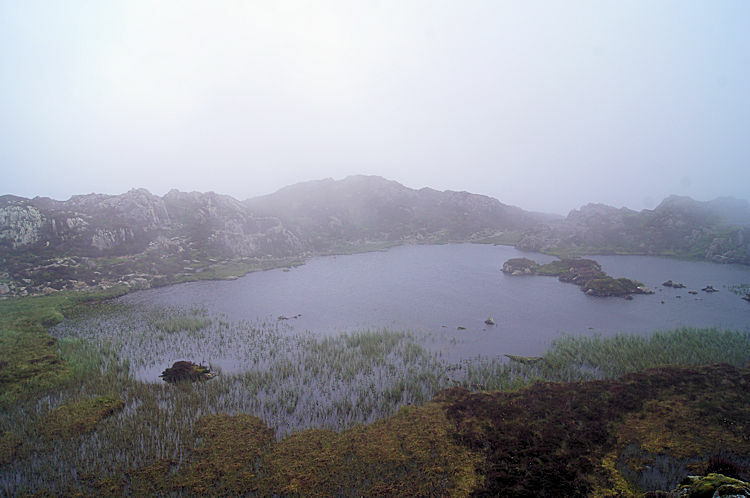 I cussed under my breath as I crossed the undulations of the summit path from the highest point towards Innominate Tarn. "Blooming cloud, just go will you" I beseeched but it was not having it. I reached an intermediate tarn at a lovely spot and with the cloud creating a spectral feel I lingered for a while and looked into it. Then after filling my imagination I continued on the path and before reaching Innominate Tarn I crossed paths with another walker. "Shame about the cloud, but don't you think it gives a surreal feel to the surroundings". 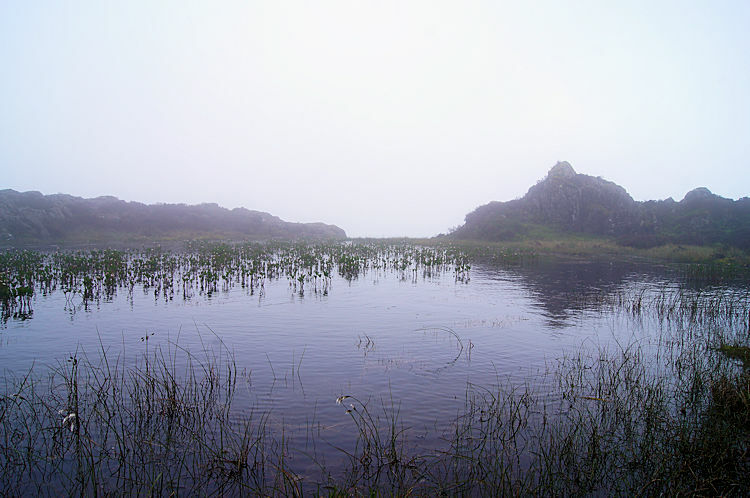 I could not have agreed more and after bidding him a good day I walked on, soon reaching Innominate a Tarn. Misty swirls of cloud swished across the scene, sometimes pausing and rising before blowing over. It was as if Wainwright's psyche was here too, settling down and closing in the view to the immediacy of the tarn and telling me to come again on anther clearer day. It was never spooky, just beguiling. 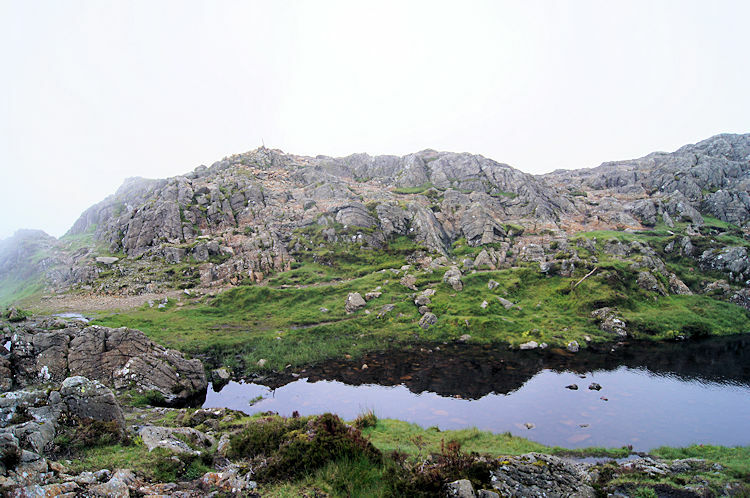 After spending 30 minutes of refreshment, contemplation and rest at Innominate Tarn I bade Wainwright farewell and stepped off the top of Haystacks by following the path down towards Blackbeck Tarn and Green Crag. 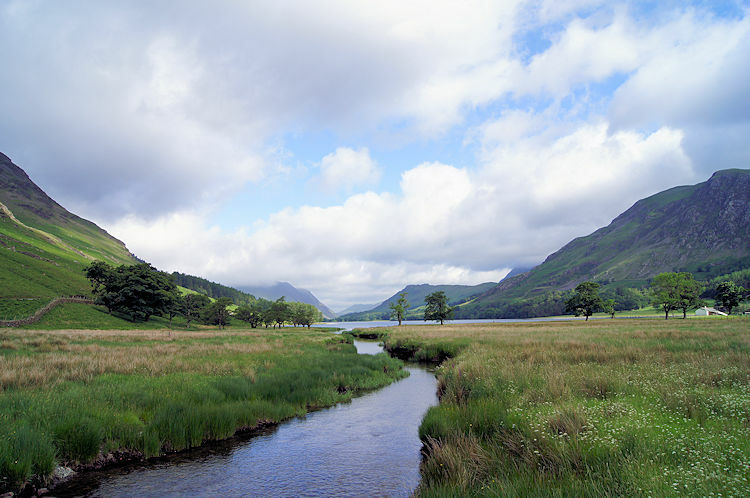 I stayed on the higher path of two, missing out on dipping my feet in Blackbeck Tarn but instead enjoying feasting my eyes on the unfolding views to my left of Fleetwith Pike and the Warnscale Beck valley heading down to Buttermere. Looking straight ahead I looked at the path rising above the far side of Warnscale Beck and I instantly noticed the grey of slate. Piles of the distinctly coloured slate were all around the site of Dubs Quarry which I headed straight for. 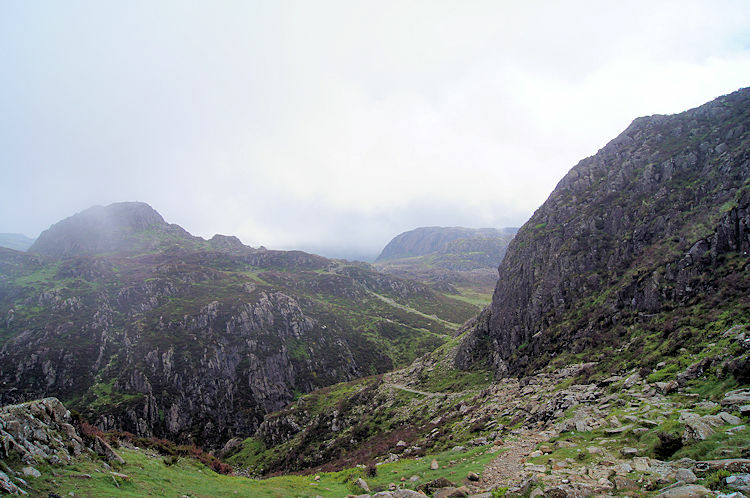 After the long descent from Haystacks to Warnscale Beck the climb across the other side of the pass tested the oxygen levels in my legs and I slowed appreciably, taking a couple of short pauses on the climb up to the quarry. Once among the slate piles I chose a conveniently shaped one and drew a smiley face onto it which I then positioned by the side of the path. I hope my happy face cheered weary souls walking by later on. Following my effort at making a piece of modern art I continued up to the winding path to meet the straight line track of the Honister Dismantled Tramway. Large rocks marked the way. While walking along the line of the long gone tramway I met a lovely gentleman who was enjoying a walk himself. We chatted about our respective passions for walking for about fifteen minutes. 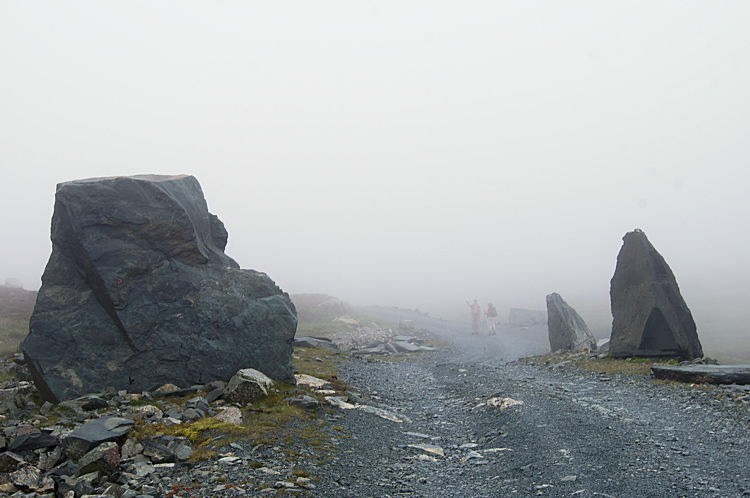 He was on his way to Haystacks and I told him I wished it were clear on top when he got there. He wished me well on all my travels too. 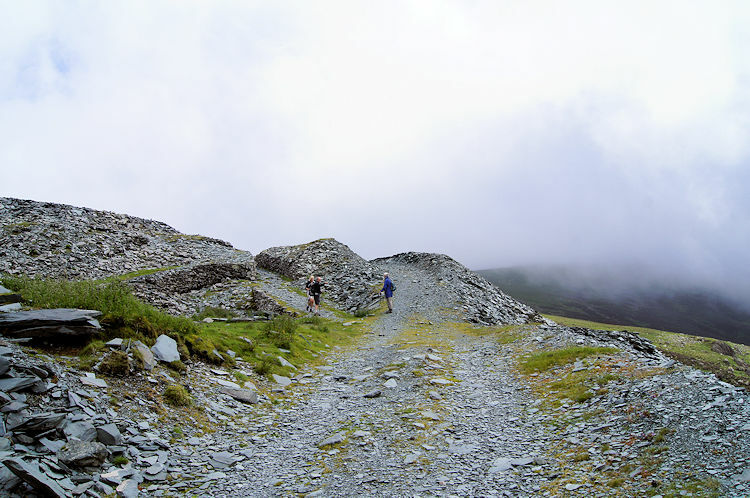 I then climbed Fleetwith Pike by way of a couple more quarries and the curiously named Black Star. I looked twice at the map assuming a typo error, surely it should be Black Scar but no we indeed have a star on Fleetwith Pike. 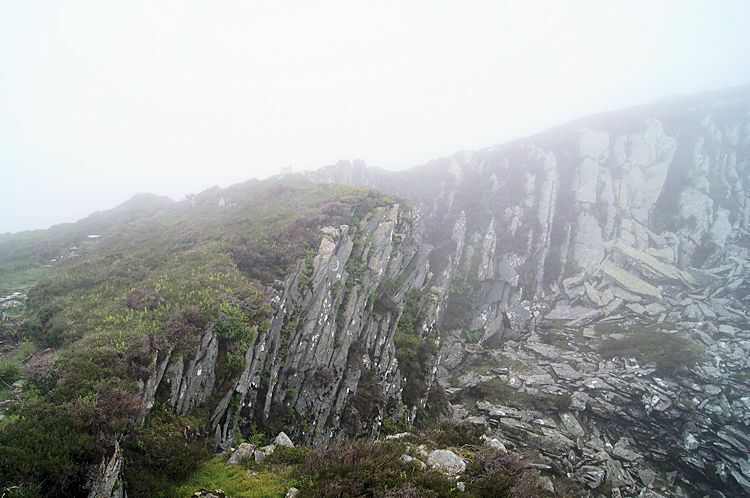 I passed Black Star and made my way to the summit, the final few yards swathed in wispy cloud but nothing like which I had experienced on Haystacks. It skirted over as I did the ritual of tapping the summit trig point and then left the mountain, dissolving into thin air as it did so. After a brief pause at the summit I then began the exhilarating walk down Fleetwith Edge. The climb down Fleetwith Edge was brilliant from the start. It is practically straight all the way, what looks like an even descent on the map but with some tricky steep parts in reality. Never hair-raising though, just a descent needing the utmost care and particularly so because you will find it difficult to keep your eyes on the path and where to place your feet. Why? Because the view stretching out north west is stunning. You will not be able to take your eyes off it for long. As soon as I began the descent of Fleetwith Edge I could sense this was something special. 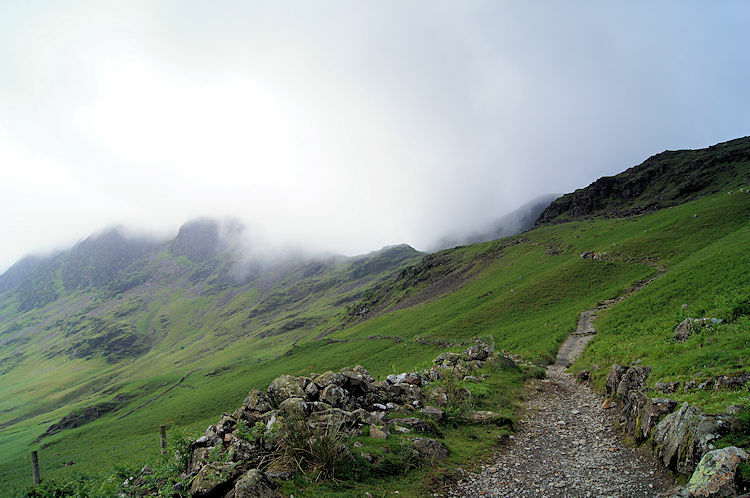 Wainwright rated it as a great climb but I shall always now rate it as one of the greatest descents in all of the Lake District. For three reasons, first the path down the edge itself, always exciting and challenging enough to keep the attention intense. 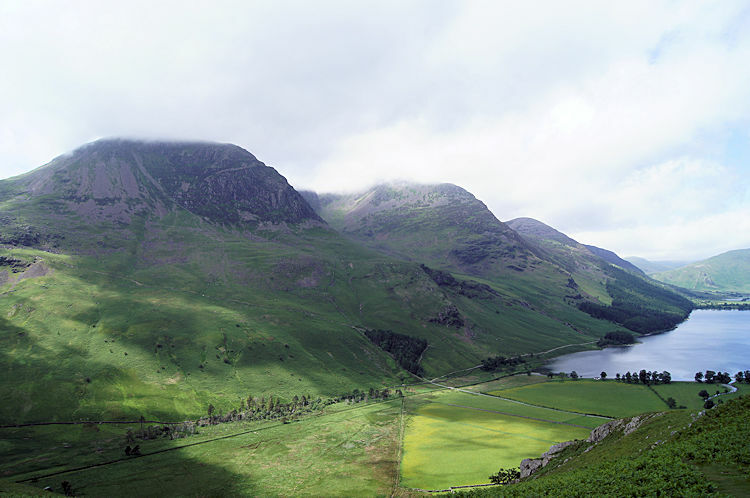 Secondly for the view I have just mentioned, not just of the Buttermere, Crummock Water gap but also of the long mountain range of High Crag, High Stile, Red Pike and Starling Dodd to the left of the gap and of High Snockrigg, Whiteness Pike and Rannerdale Knotts to the right of the gap. Thirdly, for being the perfect conclusion to a walk which is without flaw. 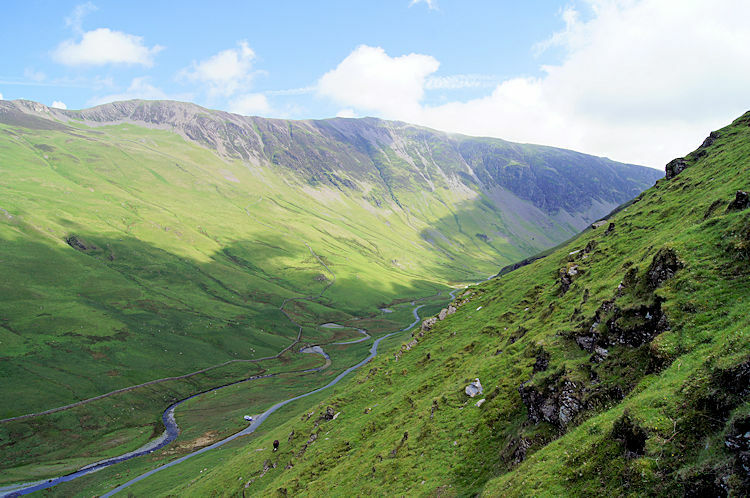 The descent of Fleetwith Edge came to a sad but inevitable conclusion, the final part almost as enthralling as the uppermost reaches with Honister Pass below me providing superb views. Equally so was the view back to Gatesgarth from where I started. As I stepped off Fleetwith Edge and onto the flat of the valley bottom I felt a pang of regret that it was all over but this was more than compensated by the bank of new memory I had now stored. I walked back to the car park with a big grin.